I wish I was going to Derry. 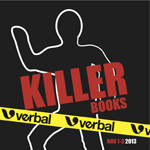 Yes, it’s a plaintive call for a trip to Ireland to attend the Killer Books Crime Festival being held November 1-3. The Halloween weekend event takes place at the Verbal Arts Centre and sounds like damned good fun. There will be authors from around the UK: Gerard Brennan, Colin Bateman, Clare McGowan and Des Doherty will join the likes of Alan Glynn, Andrew Pepper, William Ryan and Stuart Neville for a weekend of workshops, readings and talks. Families will be able to enjoy the Verbal CSI Lab, exploring fingerprinting and experiments. They can also participate in a spooky Murder Mystery night on the city’s Walls as well as a Derry Victorian Crime Ghost Tour. For the family’s Mini-sleuths there will be an opportunity to join the Verbal Detective Agency to fight crime. Older crime fans can listen in to talks by pathologists, psychologists and forensic experts. In addition local author Brian McGilloway (Inspector Devlin series, DS Lucy Black series) will launch his latest novel ‘Hurt’ during the event. From across the pond, Lee Child will be in attendance. Oh yes, I do indeed wish I could be in Derry. What about you? How far would you travel to attend an event featuring something you are passionate about? I haven’t done this yet, but I should! Take me with you – please!